Hanoi (VNA) – Vietnam hopes the World Bank (WB) will continue to support the country to cope with challenges, especially climate change adaptation, renewable energy development, education, healthcare, and youngsters’ startups. Politburo member and Chairman of the Vietnam Fatherland Front (VFF) Central Committee Nguyen Thien Nhan made the remark at a farewell reception for former WB Country Director Victoria Kwakwa, who is serving as new Regional Vice President for East Asia and the Pacific. 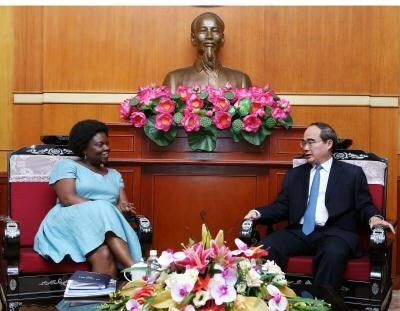 He congratulated Victoria Kwakwa on her new post and highly valued her remarkable contributions during her working tenure in Vietnam, particularly in the fields of policy consulting, financial support, education-training, agriculture, production and exports, thus improving local living standards. The official expressed his pleasure at the comprehensive and pragmatic cooperation between Vietnam and the WB, confirming that Vietnam attaches much importance to the effective use of loans from the international community, especially the World Bank (WB), for socio-economic development and poverty reduction efforts. The guest thanked the Vietnamese Party, State and people for supporting the WB programmes and hailed achievements that the Southeast Asian country has gained over the past years, notably macroeconomic stabilisation, climate change resilience, social welfares policy and private economic development.